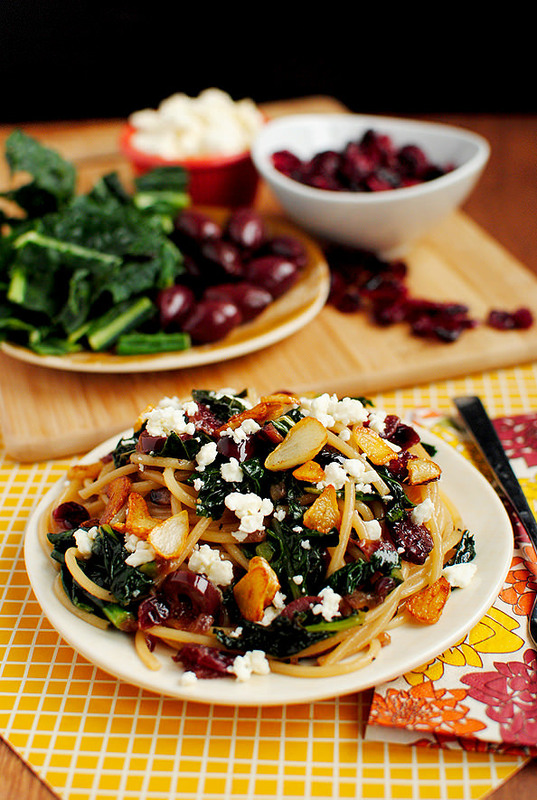 Pasta with Toasted Garlic, Dried Cranberries, Kale, Kalamata Olives & Feta is one of the best pasta dishes, EVER! Like the new (to me) concept of “arm parties“, and the treadmill desk I MacGyvered out of an old board, reusable shopping bag, duct tape, and sheer determination last weekend, today’s recipe of Pasta with Toasted Garlic, Dried Cranberries, Kale, Kalamata Olives & Feta is definitely filed under just crazy enough to work! 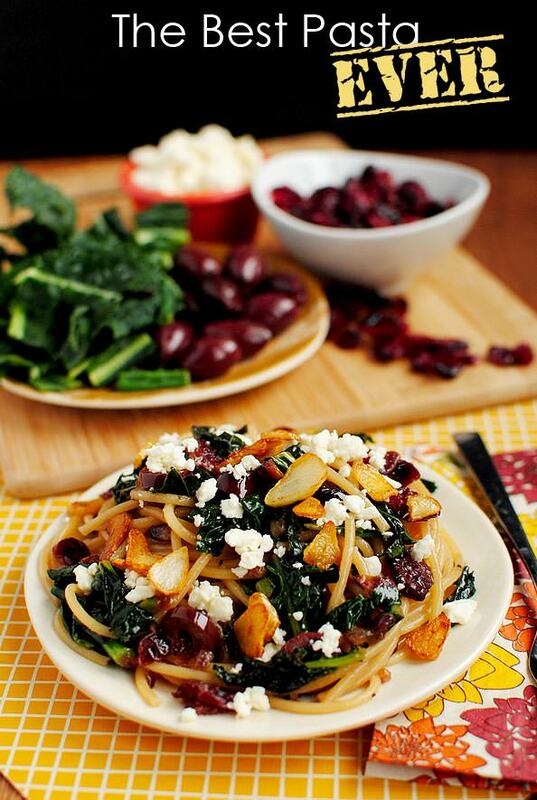 Not only is the wickedly-delicious combo of garlic-infused olive oil, dried cranberries, torn kale, sliced kalamata olives, and crumbled feta cheese tossed with spaghetti just crazy enough to work, it is without a doubt one of the best pasta dishes I’ve had – EVER. The ingenious recipe comes from Maria @ Two Peas and Their Pod, via her sister-in-law, and the second I saw it, I knew I had to have it. A gathering of ingredients as unique as this just had to be good. And it was. No sooner than two minutes after snapping these pics I slurped down every last noodle on my plate, perhaps even going so far as to licking it clean, then, with mouth still watering, I had to restrain myself from eating every last sweet and salty bite left in the skillet. If you are looking for something new and absolutely delicious to add to your weekly rotation, make it this “Crazy Pasta”, as Maria calls it. Sauteed in one skillet, and made with fridge and pantry staples to boot, I cannot wait to have this again! Start by assembling all your ingredients. This skillet supper cooks quickly, so you’ll want to have everything chopped and ready to go before turning on the heat. First heat 2 Tablespoons extra virgin olive oil in a large skillet, then add 6 cloves sliced garlic and let them toast in the oil until they’re just barely turning golden brown. Any darker, and they’ll start to taste bitter. Remove the slices to a plate and set them aside. Not only does this step produce the to-die-for pasta topping of toasted garlic, but it also infuses the oil, and all subsequent ingredients cooked in it, with an unbelievable garlic flavor. 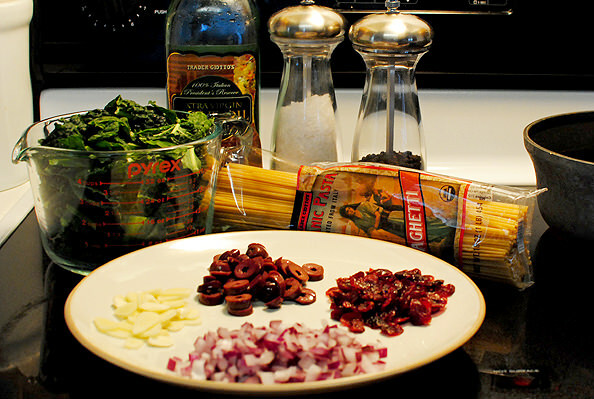 To the garlic infused oil, add 1/2 minced red onion, season with salt & pepper, then saute for 3 minutes until the onions are golden brown and tender, then add 1/4 cup dried cranberries. 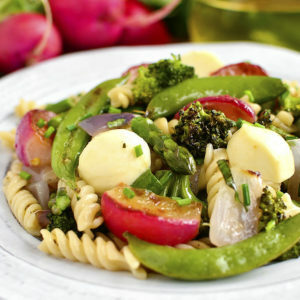 The cranberries kind of melt into the olive oil and provide a PERFECTLY sweet background flavor in this pasta dish. Next add 4 cups torn kale, as well as a bit more salt & pepper. It’s always important to season each layer of ingredients when cooking! 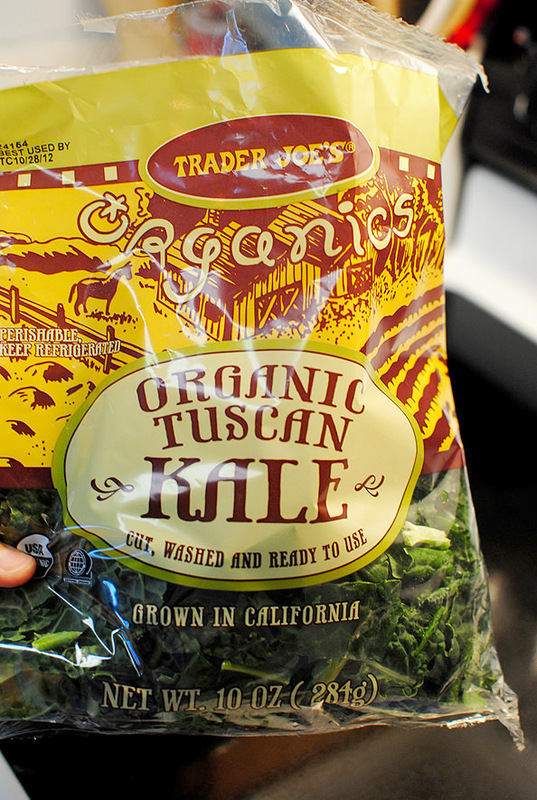 BTW, I used this pre-torn kale from Trader Joe’s since they didn’t have any whole bunches. It’s very convenient, but just try and remove any stemmy pieces, as they don’t really get tender as they cook. 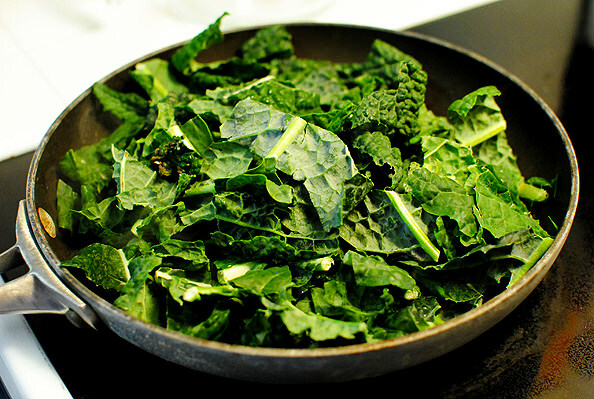 Toss the kale to coat in the oil, then add 1/4 cup water to the skillet, pop a lid on top, and cook for 3-4 minutes, or until the kale is tender. 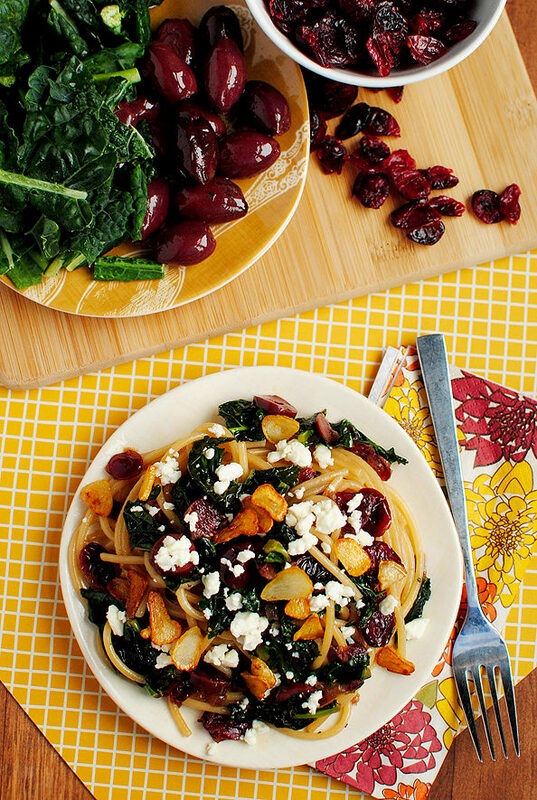 To the cooked kale and cranberries, add 1/4 cup sliced and pitted kalamata olives. The olives add an awesome, salty bite to the pasta that I just love. Finally, transfer the cooked spaghetti by way of tongs to the skillet, then toss everything together, adding up to 1/4 cup pasta cooking water to create a little sauce. 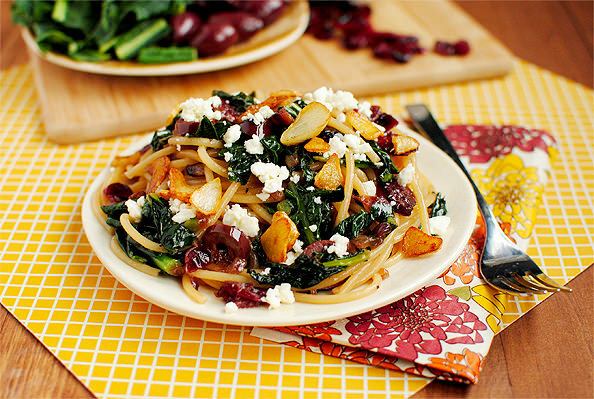 Divide the pasta between two plates, top with the toasted garlic slices and a wee bit of crumbled feta cheese, then devour! Heat olive oil over medium-high heat in a large skillet. 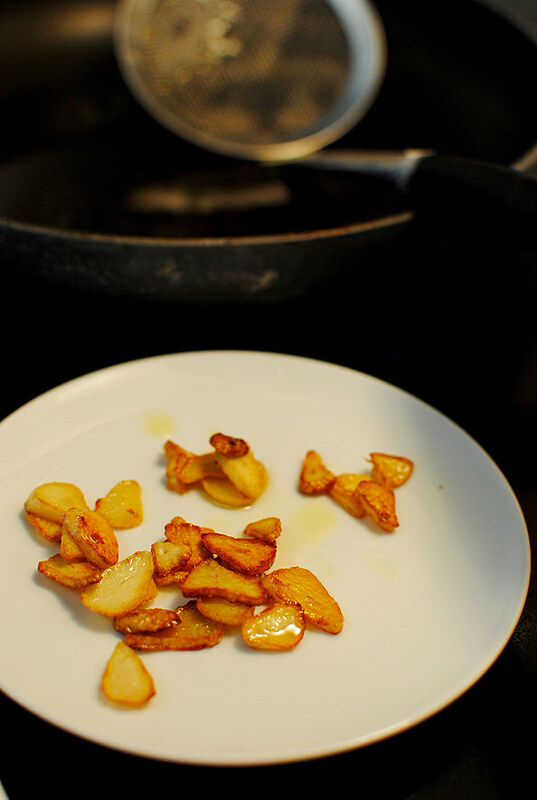 Add garlic slices then cook, stirring near constantly, until slices are pale golden brown. Remove to a plate and set aside. Turn heat down to medium then add red onion. Season with salt and pepper then cook until golden-brown and tender, about 3 minutes. 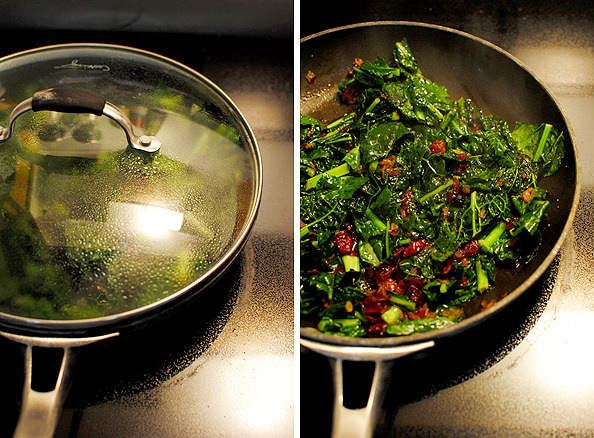 Add cranberries and kale, season with more salt and pepper, then add water, place a lid on top of the skillet and cook for 4-5 minutes, or until kale is tender. Add spaghetti to a large pot of salted, boiling water then cook until al dente. 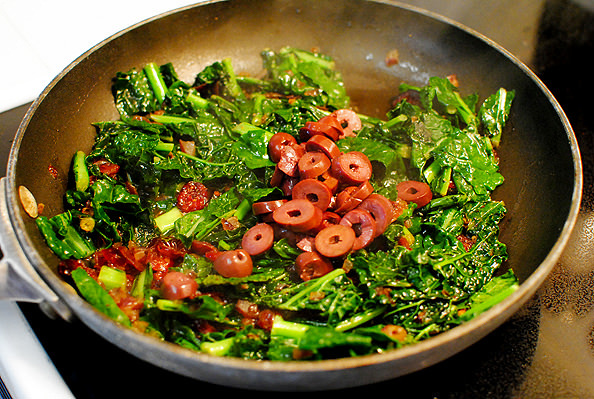 Add kalamata olives to cooked kale and cranberry mixture. 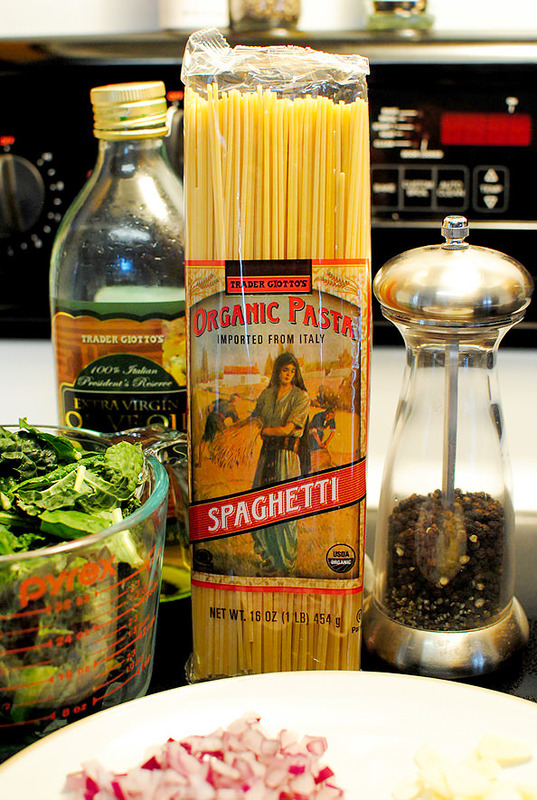 Transfer cooked spaghetti to skillet then toss to combine all ingredients. Add up to 1/4 cup pasta cooking water if needed. Divide between two plates then top with 1 Tablespoon feta cheese and half the cooked garlic slices each. Banish any skeptical thoughts you may have about this dish, and just start cookin’! 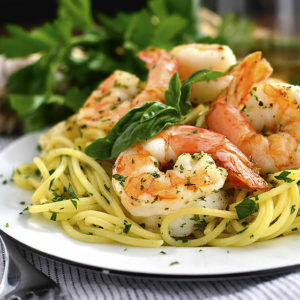 While you can pick out each individual ingredient in the pasta if you try, what I really like about this dish is the way that everything kind of melts and melds together in each, over-the-top bite. Can you tell I liked this? A lot?! Thanks Maria! 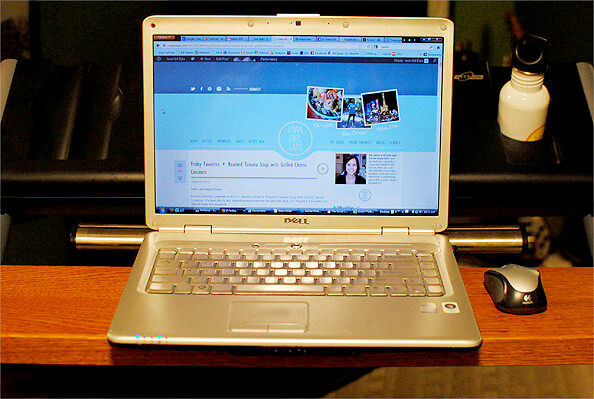 Well, you see, I am the world’s slowest writer so between editing pictures and writing my actual blog post each day, I sometimes find myself sitting and working for three or more hours at a time without moving. Unacceptable! I’ve been lusting after a treadmill desk – a treadmill with a large work surface attached – to remedy the situation for years, but am unwilling to shell out $1,300 to get one, so I did the next best thing and made one myself! 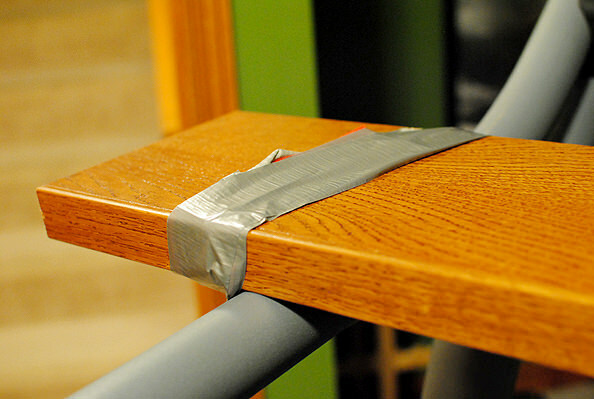 I found a random board in our basement then secured it to the rails of the treadmill with strips of reusable grocery bags that I cut out and reinforced with duct tape, which I then duct taped together. Of course I don’t walk on it for three hours straight, and top out at 1.3mph, but hey – it’s better than nothing! That treadmill desk is awesome. Totally something I would do.. every step counts!!! Plus it’s probably nice to stretch your legs! No judgment here. I am dying….. you are hilariously intelligent for doing that. How fast do you walk? Are you walking while you read this? Bahahaha. I only walk like 1.3mph. :) And right now I am watching my Mom touch up the paint on my kitchen wall –> horrible daughter!! That treadmill desk though, equal parts hilarious and awesome. oh.my.gosh. 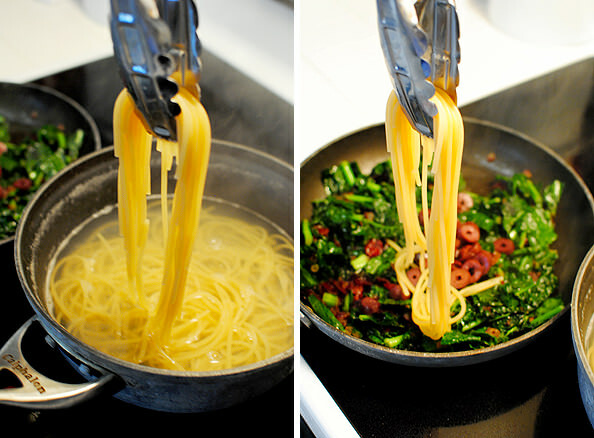 i love throwing dishes like this together, my husband calls me the pasta skillet queen. also, i have been craving a treadmill desk forever and a day. i work in an office, so short of medical necessity, it’s still just a dream! Pasta looks great… but that treadmill desk!! Definitely crafting something like that this weekend! :) Too cool! I LOVE your treadmill desk! The multitasker in me has always lusted after one of these. You are walking the healthy living walk, Kristin! So glad you liked the pasta! It one of my favorite pastas of all time! I could eat it every night! That pasta looks amazing! Wonder how it would taste with sundried tomatoes instead of dried cranberries? I love the treadmill desk! Now you can spend hours writing while walking and never feel guilty again! By the way the pasta looks delish too! Hahaha, busted! That’s actually pretty good for me, usually I have 15+ up! I was just planning my menu and wrote “pasta?”…I was hoping for a recipe to try!!! However…I’ve never had kale! Is it like spinach? I’m going to be adventurous and pick up a bag at TJ’s. It’s like a heartier spinach and doesn’t get as soft when sauteed, which I really, really like. I pretty much use it in place of spinach in all skillet and soup recipes these days! Damn, now I want a treadmill desk. Genius! This pretty much has everything that I love in it! I love the desk too! i am DYING over this treadmill desk!!!!!! genius girl!!! Just wanted to pay you the compliment of: This is a great site. I have been following you/the site for the last year. As I am typing, I realize I may be one of the few males to comment (besides maybe your husband, who should always be smiling with this great food). I have been recommending this to my friends, website fans, family, the teams I coach, and anyone that wants to talk cooking. I have found a joy in practicing your recipes, tweaking sometimes. You let me perfect caramelizing onions! Paninis are better now. Thank you for the effort and thoughtfulness you put into your words, recipes, and site. Love your blog! Just found it a few days ago! I made the Chik-fi-la (sp?) bites tonight for dinner and they were fabulous! Mmmm! 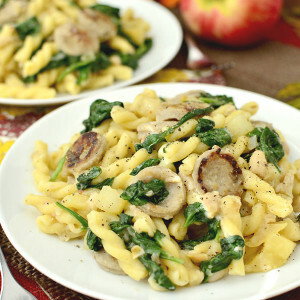 Question: do you think I could use spinach instead of kale for this recipe? I have the same question re: spinach replacing the kale. LOVE LOVE LOVE this blog!! I don’t see why you couldn’t! I’d use baby spinach, and up the amount to 6 cups since it wilts to much more than kale. This reminds me of a beloved pasta recipe in our house, found in a People magazine a few years back courtesy of Bob Harper from The Biggest Loser (we don’t even watch that show, but maybe you do). It’s basically garlic, a couple of roma tomatoes, kalamata olives and toasted walnuts sauteed in EVOO. Add to pasta, along with torn basil. Sometimes I sprinkle on top a little freshly shredded parmesan. 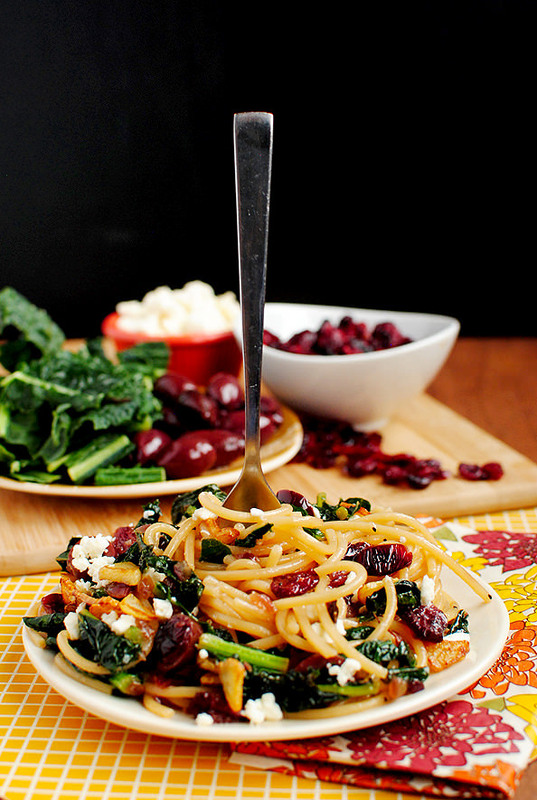 I am going to have to try your version…love the addition of cranberries & kale! 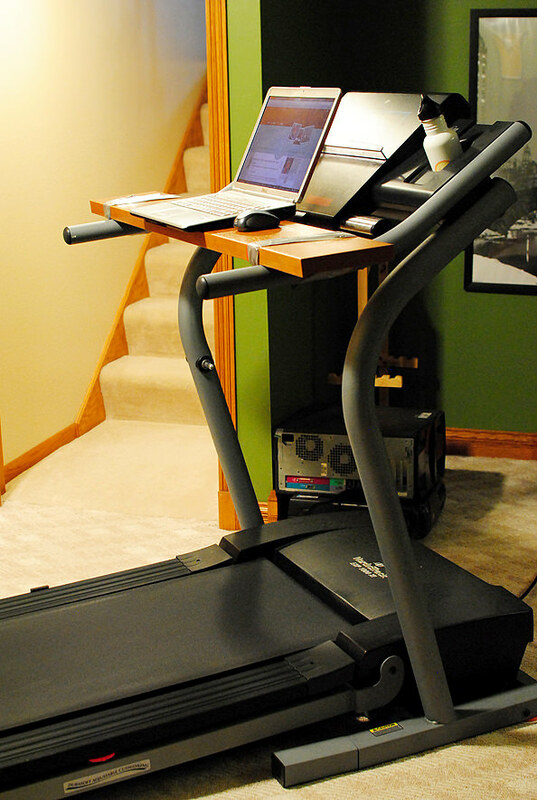 Awesome treadmill desk! I wish I could have one of those at my job haha! I’m not a huge fan of olives so I’m not sure if I would like this dish but I do LOVE sweet/salty combos so maybe I’ll give it a try? 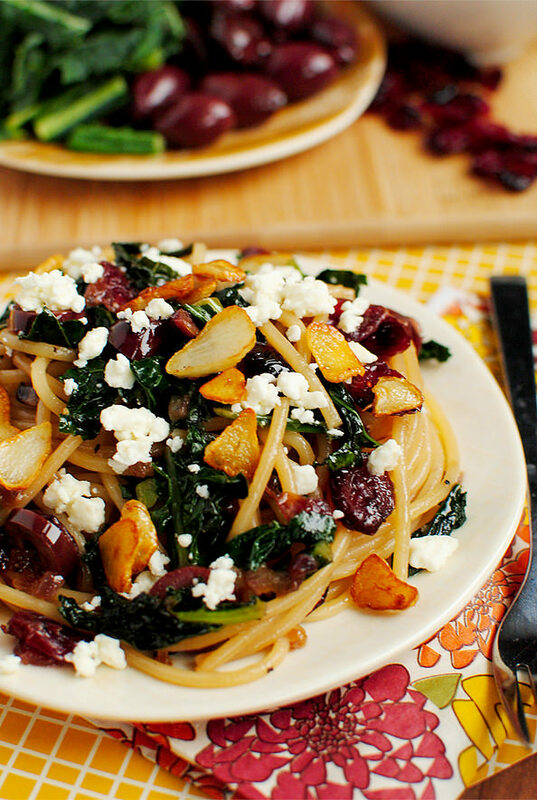 I don’t know if my hubby would eat that pasta dish, but it looks divine to me! Might be for a night I have alone or a girls night. I love your creativity with a treadmill desk! I love the idea of a desk treadmill! Where I work, there is a walk station we can rent for 30 minutes at a time and the maximum MPH is 2.0. Genius! 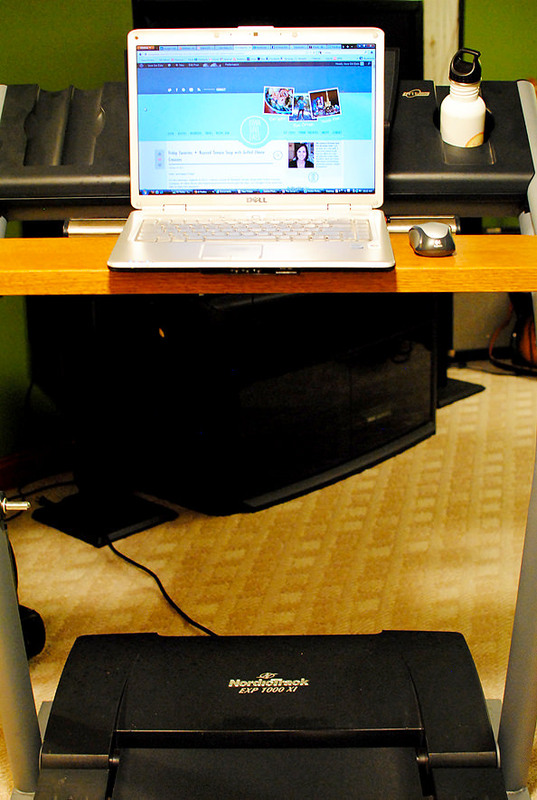 The DIY treadmill desk is freakin-fantastic!!! This pasta does look pretty darn amazing, and I love that you taped a board to your treadmill. I need to invest in both so I can get up and multi-task! Anything with feta and olives in it is amazing. I can’t wait to try this recipe! Your basement is the color of my kitchen! My husband picked it. I was shocked because it’s a really green green and he’s a “what’s wrong with a white wall?” type of guy. I love it though. You seriously crack me up!! I’m always laughing when I read your blog, thanks for the laughs and great recipes!! 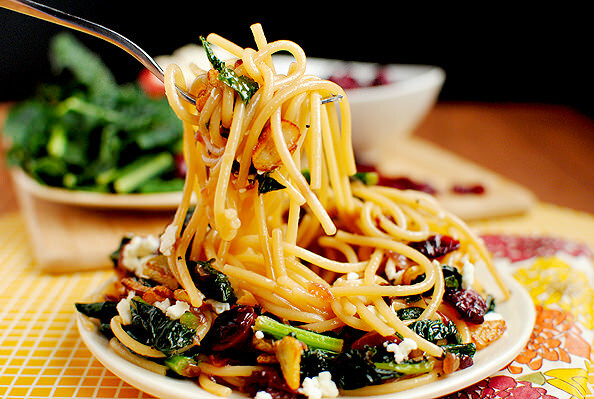 This pasta dish looks crazy good! I love everything about it, including the quick preparation. Can’t wait to give it a shot. And the treadmill desk – hilarious. Points to you for your creativity! Love your treadmill desk, but I think I would love this pasta dish even more! ;) I’m so making this next week! 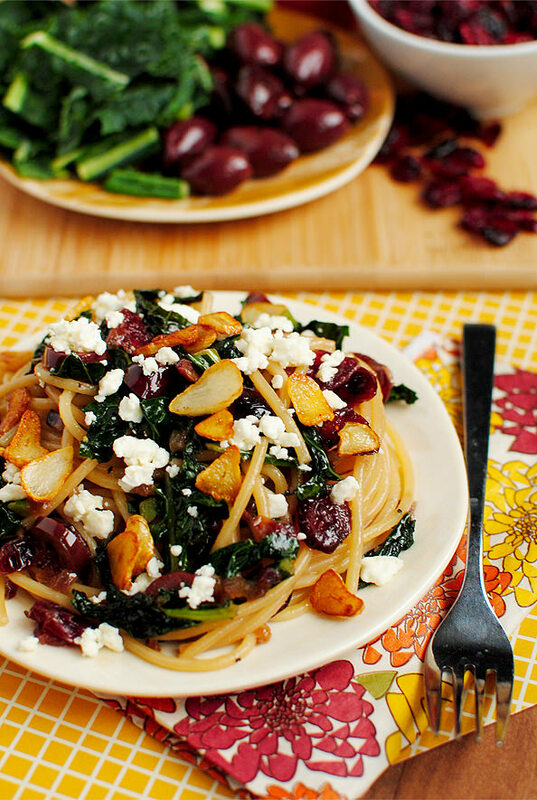 I love the dried cranberries mixed with the other savory ingredients. Wow, that treadmill desk just blew my mind! What a great idea! I get so stiff from sitting in front of the computer for ages, walking and working at the same time would be so great! The pasta looks amazing too. Those garlic slices look so luscious! Kale is tough to find where I live, but I’m going to see if I can’t hunt some down and try this out. Thanks for the recipe! Just made this pasta…fast and Very VERY YUMMY!!!!!!! Loved every bite. 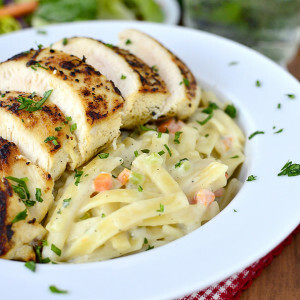 I bought all of the ingredients required and I am making this tonight. It looks divine, so I can’t wait to try it. I love your site, I have made several of your dishes and none of them have disappointed me. I seriously admire the treadmill desk!!! Even at like 1 mph I’m pretty sure I’d fall and break my head open. Made this twice this week and all I can see is OMG! This is so delicious and doesn’t take long to make. Love it! What a great combo of flavors. Made this tonight for dinner..but instead o feta (which i love) i grated asiago and romano for my husband, he doesnt like feta….i put bleu cheese on mine, and added chopped walnuts to my mix….omg..sooo good..those craisins are amazing….i bought them in blueberry flavor too..might try those next time..i betcha sauteed mushrooms would be amazing as well..thanks so much for the recipe! I LOVE THIS RECIPE!!!! I tried it last night since I had the majority of ingredients on hand….I could not stop eating it! Thank you for all your great recipes, life stories etc! Love checking your blog everyday as a fellow Iowa Girl! I made this tonight, and it was very good. A very interesting mix of flavors, I might put some more dried cranberries on it next time because I loved that hint of sweetness. Yum! This was great!